The Dog Behaviour Lady- Excitement or fear? Barking at Dogs. Wants Play? Scared? Even dogs who are mostly fine with other dogs have their moments. Then the owner can be affected out of all proportion, making walks a worry instead of a joy. Reuben is generally a highly-wired little dog. Running around with lots of dogs fires him up. Being crowded by too many other loose dogs alarms him. Being held, trapped, on a lead can also make him feel vulnerable and unsafe. His state of mind even before starting out on the walk may well influence how he reacts to other dogs on the walk. 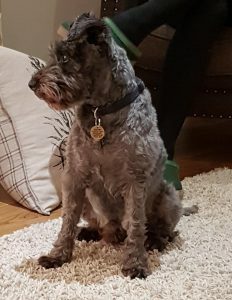 His lady owner’s own understandable emotions – her anxiety and embarrassment when he barks at a dog – will be picked up by Reuben too. 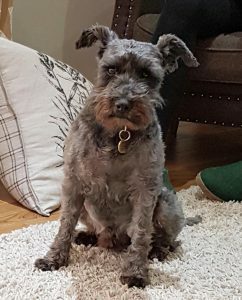 Reuben is an absolutely delightful Miniature Schnauzer, eight years of age, affectionate and friendly. He has good control of the things that worry him at home. If something scares him, he doesn’t confront it but takes himself off. He lives with two young children who jump around him. It doesn’t faze him at all. If he hears raised voices or any hint of conflict however, he simply removes himself. Out on walks, on a lead or surrounded by other dogs in a field, if he feels uneasy he can’t simply remove himself as he does at home. He has no choice but to deal with it head-on. This usually involves barking, but he’s pinned a smaller dog down and drawn blood on another’s ear. The lady’s job as Reuben’s ‘guardian’ is to both manage the situation so further incidents don’t happen whilst also gradually changing how he feels about other dogs. If she can be a bit more upbeat it will help both her and Reuben, I feel. He will more readily give her his attention if she is enthusiastic rather than anxious. If she now keeps him on a long line instead of running free and increases distance if he’s reacting, she need no longer be anxious. She finds it hard to determine whether at any one time his barking and reactivity is due to excitement or to fear. I suspect the two overlap. A couple of incidents this past week have upset the very conscientious dog owner her more than they should, one involving another dog walker. She should try not to dwell too much on the very few negative episodes spread over the years. We are programmed towards a ‘negative bias’. Psychologist Rick Hanson describes it like this: “The brain is like Velcro for negative experiences but Teflon for positive ones.” So we are hard-wired to overestimate threat and underestimate opportunity.”. The fact that so much of the time Reuben mixes with dogs with no trouble at all is a huge plus. I have suggested the lady takes things slowly and in a systematic way – for her own benefit as much as Reuben’s. She can start with relaxed road walks and avoid other dogs for a week or so. In this time she can absorb my instructions and look at some of the videos and articles. She can do some role-play with imaginary dogs and practise her emergency escape procedure should it be needed. During this week she can take him somewhere she knows there are no dogs and let him off lead for a run. The next step is to start encountering dogs. She will limit dog encounters to one or two initially whilst following the procedures before coming home again. She can visit open spaces with just a few dogs – going at a time that’s not busy and putting him on a long line. Again, she should follow the same strategies whether it’s excitement or fear that he is feeling. On a long line he will never be out of control and she can simply drop it if in agreement with the other owner that the dogs can play. Off-lead and out of control dogs along with unreasonable owners are just unavoidable hazards unfortunately when taking our dogs for a walk in public places. We can’t change this, but we can change our own dog’s coping mechanisms along with our own. It is possible they have unrealistically high expectations of Reuben. Just as with people, dogs will naturally get on with some dogs better than others. What mostly happens is a quick grumble followed by both dogs separating which isn’t a big problem. Our ultimate aim is for their work to make Reuben a lot more resilient and confident. NB. For the sake of the story and for confidentiality also, this isn’t a complete ‘report’ with every detail, but I choose an angle. The precise protocols to best use for your own dog may be different to the approach I have worked out for Indie. If you find instructions on the internet or TV that are not tailored to your own dog it can do more harm than good. One size does not fit all. If you live in my own area I would be very pleased to help with strategies specific to your own dog (see my Help Details page).